This is one of four roundels (Museum nos A.14 to 17-1945) carved with the symbols of the Evangelists. The Evangelists were Matthew, Mark, Luke and John, who wrote the four Gospels of the Bible. 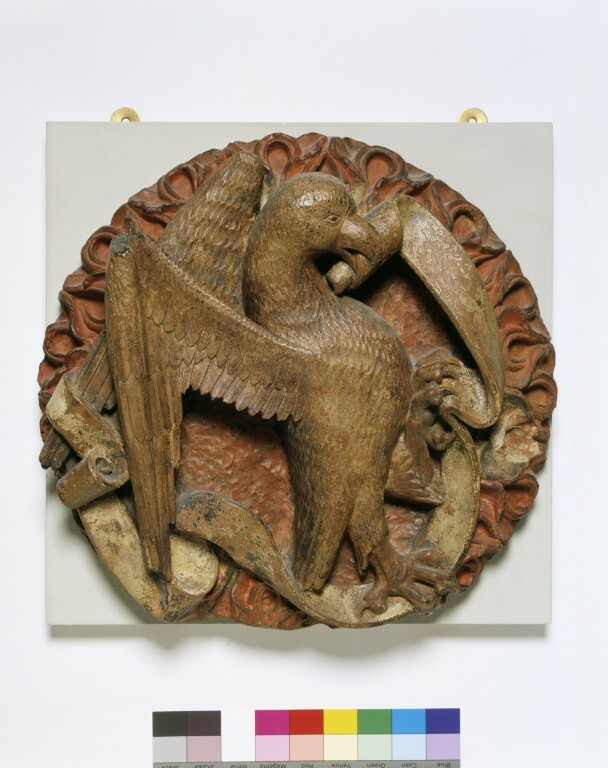 This roundel is carved with the eagle that symbolises St John. These roundels were originally roof bosses, a type of decorative carving used on a ceiling. The backs are flat and each relief has two iron rings, one set above the other, to fix it to the arched ceiling. These roundels were part of a group of bosses that originally decorated the vault of the library on the north-east side of Utrecht Cathedral. The subject of the four writers of the Gospels was particularly suited to a library. They were carved by the Utrecht sculptor Jan van Schayck. He was paid 16 guilders in 1497 for the bosses and other carvings he made for the library. These roundels remained in Utrecht Cathedral probably until the early 1800s. They were then part of several private collections until they were given to the V&A in 1945. 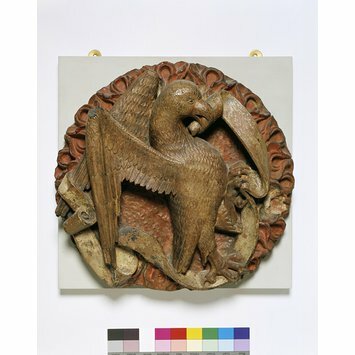 Roundel carved with an eagle, the symbol of the Evangelist St John. The eagle clasps a flowing scroll in his talons, his beak is open. The back is flat with two iron rings, one above another, to secure the object to a wall. Originally polychromed and gilded, the relief have been covered with later overpaint, primarily with with a thickly applied layer of red around the edges. This boss, with three others also in the Victoria and Albert Museum and theree others in the Centraal Museum in Utrecht - originally decorated the vault of the library on the north-east side of Utrecht Cathedral. The carving of this boss is fortunately fully documented as the work of Utrecht sculptor Jan Van Schayk, described in the accounts as a beeldenssnidjer, who was paid 16 guilders in 1497 for "die sloestyn ende capitelen mit halfbeelden te maken in die librieen" (the bosses and capitals with half figures he made in the library). The painting of the sculptures was executed by Ernst van Schayck and Dirck Scay. The sculptures remained in Utrecht Cathedral, probably until the beginning of the 19th century; they then entered the collection of the lawyer and archivist Petrus van Musschenbroek (1764-1823) Utrecht, until 1826; Musschenbroek collection sale, Leiden,1826: Collection of A.W.N. Pugin (1812-1852) and thence by descent to his grandson Sebastian Pugin Powell (1866-1947); given to the Victoria and Albert Museum by Sebastian Pugin Powell in 1945. Historical significance: Jan van Schayck was one of the major masters employed by the cathedral and other churches in Utrecht in the last decade of the 15th century and the first twenty years of the 16th century, who carried on with vigour the distinctive stylistic tradition established by Adriaen ven Wesel around the 15th century. The other bosses in the collection of the V&A complete the set of the Evangelists with the emblems of Matthew, Mark and Luke. The bosses in the Centraal Museum in Utrecht show half length figures of St Augustine, St Jerome and St Gregory the Great. The ensemble would have been completed by the fourth father of the church St Ambrose (now lost) and probably by a larger boss God the Father blessing now in the Rijksmuseum Het Catharijneconvent in Utrecht, which would have been placed in the centre of the vault. Such an iconographic programme would have been eminently suitable for the decoration of a library, reminding those below of the writings in the four Gospels and the achievements of the four great scholars of the early church, and a virtually identical programme - but this time with a boss of the Virgin and Child at the centre - is also seen in the treasury of Cologne cathedral, which was originally a library. Roundel, St John, eagle, Utrecht. Williamson, P. Netherlandish Sculpture 1450-1550 (London: Victoria and Albert Museum 2002. p.160.) . ISBN 1851773738. Williamson, P, 'Roof Bosses from Utrecht and Jan Van Schayck, Beeldensnijder', Oud Holland CV, 1991, p. 140-51.